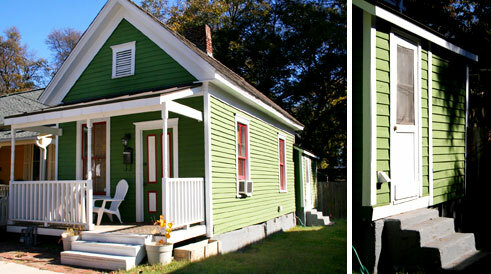 The home style I most love from the South is the Shotgun House. These are the long and narrow homes, often in a row, that catch your eye for their unique and endearing shape. They get the name shotgun because if one fired a shotgun through the front door, the bullet would go straight through the back door. The shotgun house is often no more than 12 feet wide, with 3-5 rooms set in a row without a hallway. This lack of a hallway allows for excellent airflow and cross ventilation throughout the home, which is a must for the hot southern summers, particularly before the invention of air conditioning. First popularized in New Orleans, the shotgun house was once the most sought after home in the South from the 1860's-1920's. Although many today have cement stairs, the original shotguns all had wooden steps. The homes are traditionally built 2-3 feet off the ground, a sure indication of their New Orleans heritage. Often, several would be built in a row by the same builder, which lent to their similar appearance. On historic Auburn Avenue in Atlanta, you'll see the preserved row of Double Shotgun homes or two shotgun homes joined together, sharing a central wall. As a sign posted outside the homes explains, "These duplexes are typical of the houses where Atlanta's blue-collar laborers lived in the early 1900's. The Empire Textile Co. built them for its white mill workers, but they moved out after the 1906 race riot, and blacks began renting them." The best areas in the South to still see shotgun homes are at Bywater in New Orleans, Cabbagetown in Atlanta, or Portland, Butchertown and Germantown in Louisville.